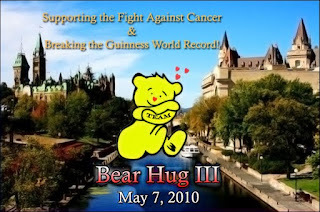 On May 7, 2010, over 16,000 Students from the Ottawa Catholic High/Intermediate Schools will once again seek a Guinness World Record with Bear Hug III around the Rideau Canal and will attempt to raise $500,000 for local charities. A Guinness World Record attempt and an amazing goal to raise a half million dollars for local charities. Giving is a complete no brainer. If a student you know is fundraising for this wonderful and amazing event, I hope you'll consider giving generously! And maybe even think about heading to the canal on May 7 to offer up your support. Hug on, my friends. Hug on.